"A great leftover ham recipe that my husband takes all the credit for. It contains leftover ham, pasta, cheese and bread crumbs in a creamy soup base." In a casserole dish, combine the ham, macaroni, cheese, soup and milk. Mix together well. Bake, covered, at 375 degrees F (190 degrees C) for 20 minutes. Uncover, top with the bread crumbs, and bake, uncovered for 10 more minutes. 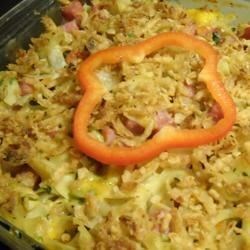 See how to make a cheesy baked casserole with ham, potatoes, and corn. I can not believe how many people are saying it is good. Ham dinner leftovers deserve much better!!!! Great recipe for a busy household. I think next time I will add some frozen peas to make a complete meal. Thanks for sharing. this was good. I added 1/4 cup of dijonnaise to it. My kids loved it and I got left overs. I am definately going to make this with leftover easter ham. Thanks.